How Long Should a Wedding Dress Be? for your big day is not an easy thing. First of all, you want to make sure that you look and feel beautiful, but also that you match the theme of your wedding & venue environment. 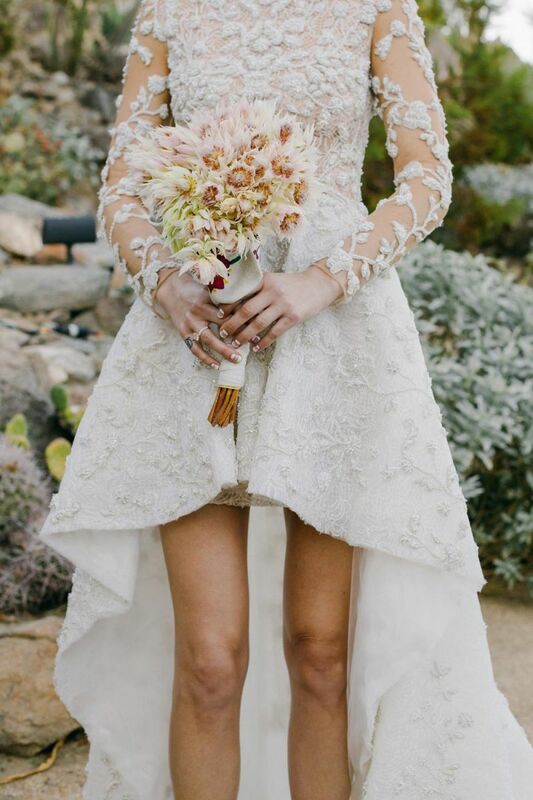 Can a short wedding dress be elegant? Traditionally, most women will opt for a long wedding dress, whether it be a ball gown, something more traditional, or something simple and classy. That said, there are plenty of short-skirted dresses that can look just as modest and elegant, too. What matters when determining skirt length is, in part, the style of the dress. The style and shape of the gown and how it hangs on your body can determine how short the skirt can be (if that’s an option of course). Be sure to openly speak with a professional at a wedding dress shop when determining how short the skirt of a dress can be, they’ll have all the answers. Consider your Wedding Venue as a factor. The location of your ceremony will be a deciding factor in how long the dress should be. 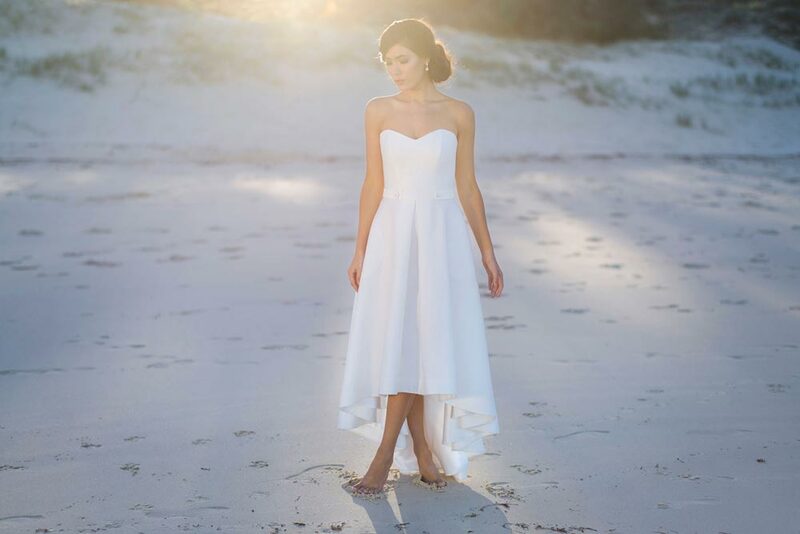 For example, wearing a dress that reaches the floor with a long train to the beach could look breathtaking, however be prepared to drag half the beach with you as you walk up the aisle. Similarly, weddings in parks, gardens, and other settings have to take into account the chance that your dress could get dirty, covered in grass, or even torn on the way. If you’re getting married indoors, be sure to discuss with your Venue Coordinator if there are any obstacles to consider. A floor-length dress, when paired with a venue that has lots of steps, can increase your risk of tripping, so be sure to be practical. Why you need to work with wedding dress professionals. When working with professionals in wedding dress stores or designers, they’ll ask the right questions and provide the greatest knowledge to help you find the best style of wedding dress suited to your tastes. 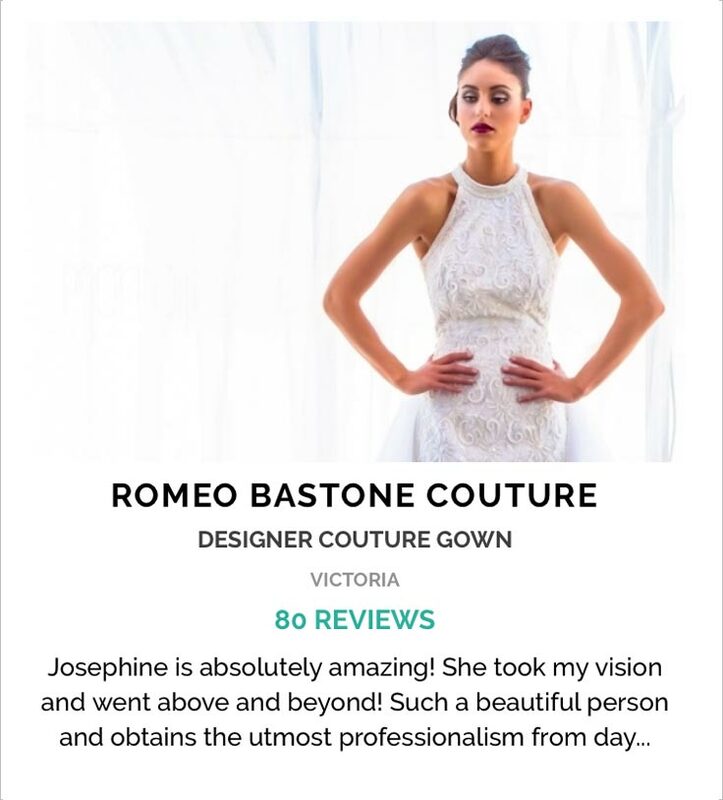 Based on our 20 years of experience in the Wedding Industry, we at ABIA highly recommend all brides to read online customer reviews of wedding dress boutiques or designers. Choosing your wedding dress is meant to be a magical journey with professional and knowledgable assistance that makes you feel your utmost comfortable. All reputable bridal gown boutiques will either have a specialist at the store or a highly recommended business for alterations regarding the length of your dress. As expected, a designer will be creating a made-to-order dress which can be amended throughout your various fittings. Your designer will ensure you feel comfortable and will provide ideas on how short your dress can be. 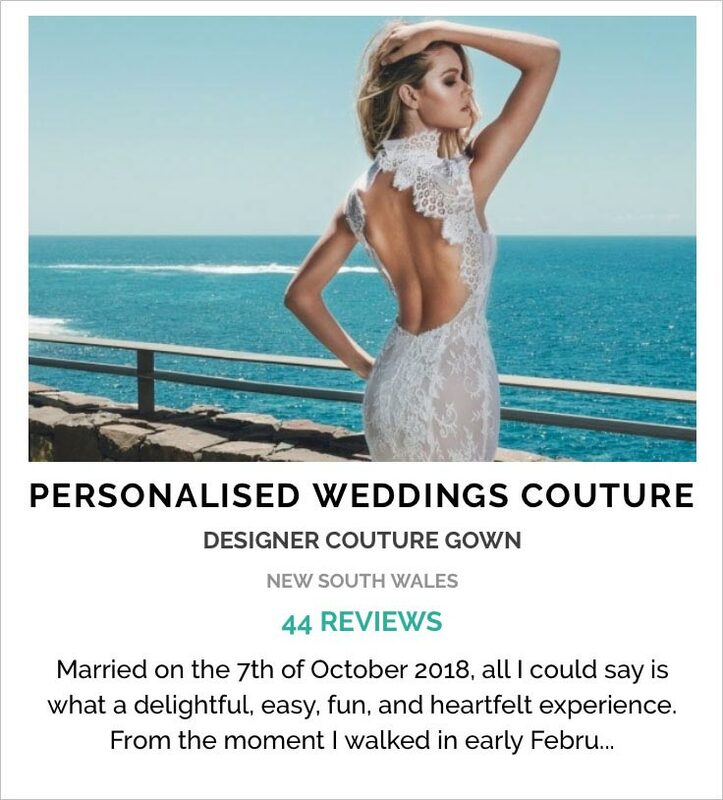 ABIA helps brides find the best dress suppliers in your area, feel free to visit the wedding dress directory and start meeting some of Australia’s best dressmakers and boutiques. For long wedding dresses, how much you can hem the gown depends on the kind of footwear you’re wearing to the big day. Wearing a skirt that reaches the floor in flats is a recipe for a quick trip to the floor. 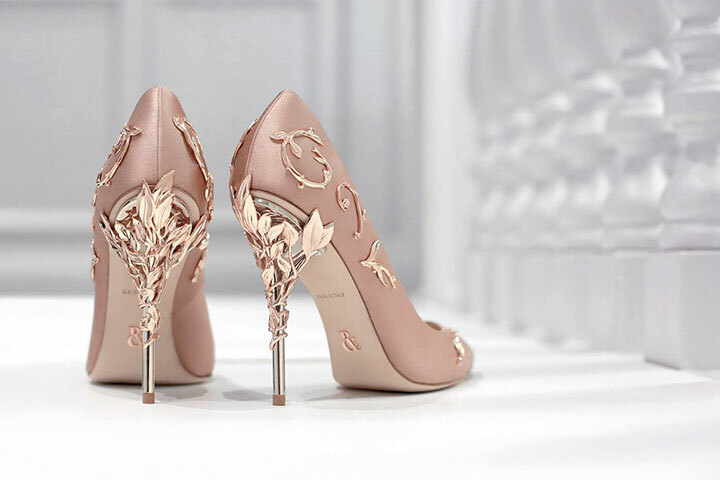 If you’re having a custom-made wedding dress, at the final fittings, you will be asked to bring in your heels to ensure the length of the dress is perfect. The same goes for visiting the alterations specialist, be sure to bring in your shoes! If you want show off your shoes, be sure to mention it so that you can get another couple of centimetres taken off. As mentioned, you don’t have to pick a long wedding dress. Dresses come in all shapes and sizes, from tea-length to ballerina, and knee-length to mini. If you want to show off your legs, then we say go for it! It’s all about what makes you feel comfortable, as well as what look you want to achieve. 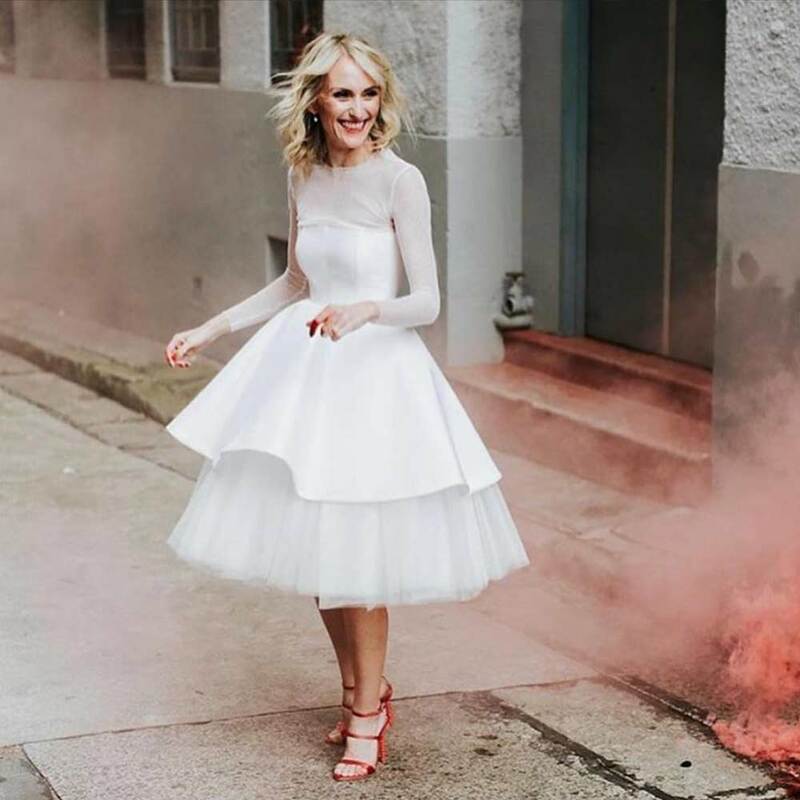 If you want to see the sheer variety of skirt lengths in wedding dresses and experiment to see which suits you best, ABIA can help you find the highest rated, award-winning stores near you. Visit the wedding directory and see which businesses best suit your style to help you find the answer to what length the skirt should be and more. Kiera Knightley in her adorable short wedding dress! So, answer to your question, 'How Long Should a Wedding Dress Be'? However long you feel comfortable in, there are no rules except feeling your most beautiful on your wedding day.